We’re going through! The Conrail embankment in Falls Township is a peril no more. 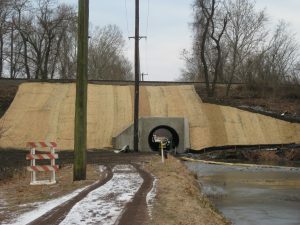 A culvert pipe still carries the Canal’s water through the embankment, but towpath users no longer have to detour around it. No resorting to the “hill climb” or rushing by the active railroad tracks. We’ll test out both the tunnel and the new detour trail at Tyburn Road on this 3.6-mile round-trip walk. Starting near Bridge Street in Morrisville, we will head a bit north and view the last obstruction on the towpath and talk about plans for a solution. Then we’ll head south under Route 1, a place that illustrates in what low regard historic places like the Canal were held in the 1950’s. The stretch of Canal between Route 1 and Tyburn Road has much industrial and commercial activity on either side of it, yet the Canal remains a green oasis with tall trees, ducks, geese, and great blue herons. When we reach Tyburn Road, we will use the new detour trail built by the DCNR regional construction crew – another great improvement. From there we’ll head back north. Ten years ago, it seemed unimaginable that the Conrail embankment and Tyburn Road obstructions would be overcome —- and now they’re history. Come walk and celebrate with us. Meet in the parking lot of the Quality Inn, 7 South Pennsylvania Avenue, Morrisville, PA 19067.